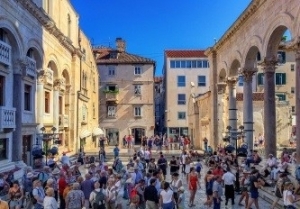 The event is hosted by City of Split and organized by the Association of Cities in the Republic of Croatia and other partner organisations with the aim to be a conference for and about cities. Contemporary cities are facing the economic pressure to utilize their resources as additional sources of public revenues. This leads to the risk of public space commercialization which is followed by additional negative side-effects for urban life (gentrification, loss of the commons, environmental issues and the like), jeopardizing one of the main city functions: to be a common place in which inhabitants can fulfill their social, cultural and other citizen needs. The contradiction between economic demands and social needs results in the emergence of a split that is becoming a real challenge for today’s urban communities. The goal of the conference is to explore the existing possibilities and tools to merge this urban split through strengthening participatory and integrated approach in shaping public places and urban development. Cities are prosperous and vital as long as they have active and engaged citizens. Citizens who care about their city, and how it functions, also care about public space and quality of life in their cities. First citizen is usually the City Mayor, followed by citizens who work in city administration and citizens who are urban professionals (architects, urban planners, traffic engineers and others) but citizens are also all the other people who live in the city and want to be engaged in creating public space. This conference is for all of them. Conference aims to gather 150 participants (among them nearly 60 creators or contributors to programme) including representatives of the relevant Croatian ministries, agencies and cities, local and international urban experts and professionals, academics and students, activists from civil sector organizations and citizens’ associations with others who consider themselves placemakers or are interested in making their cities a better place for living. Working language of conference is English with the translation of some parts of the programme to Croatian.The conference will consist of plenary part, interactive workshops and panels in the main venue (day 1 & 2) and on-site workshops (day 2) that will be held on sites in Split, Šibenik and Zadar. The conference has a strong preference for workshops and panels of combined contributors from various European cities that are going to be connected on similar themes and subjects and challenged to conduct workshop/panels collaborating as a team. Confirmed panelists and workshop leaders include professionals and placemakers from 13 countries. Split is the second-largest city in Croatia. It is famous for its Diocletian’s Palace, a Unesco World Heritage site dating from the fourth century AD. The city centre is located within the walls of the palace and contains dozens of bars, cafes, shops and restaurants where you can try excellent Dalmatian seafood and wines. The waterside promenade (Riva) is the locals’ favourite place to take a stroll and stop for a coffee. The Marjan hill, west of the centre, provides hiking trails in the protected forest and fantastic views. Split is also a gateway to many of the Dalmatian islands. Split Airport is in Kastela, 24 km northwest of the city. The airlines operating there include Eurowings, Croatia Airlines, Austrian Airlines, British Airways, easyJet and others. 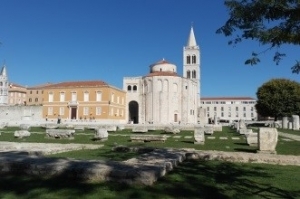 Split is also connected with A1 highway from Zagreb, connecting the continental part of the Croatia with Mediterranean Dalmatia.The main bus station, located beside the harbour, connects Split with international and domestic cities, including the hourly buses to Zagreb and Zadar. Trains head to Split Train Station from Zagreb (four daily) and Knin. You can also travel from Ancona in Italy by ferry. The conference is going to be held at the Dom mladih (Multimedia Culture Centre), a space dedicated to providing a platform for creation and participation in the contemporary art and culture and the associated social processes. The conference venue is not far from the city centre, 15-20 minutes walk away from the Diocletian’s Palace. Click here for more information about the city.